Table Top Wilderness is a 34,400-acre property in western Pinal County. Table Top Mountain (4,373') is high enough to be recognizable from Phoenix but it takes about two hours of drive time to approach the wilderness boundary. The topography is rugged: large lava flows, flat-topped mesas, steep ridges, wide canyons and heavy chaparral (creosote bush, mesquite, ironwood and bursage) lining the sides of the sandy washes. Most folks come to hike the four-mile Table Top Trail. Maybe it's because they've heard about the 40-acre island of grass on the summit. Maybe it's for the panoramic views of central Arizona and the Sonoran Desert. Maybe it's because the saguaro forest on the southwest side of Table Top is so dense... Some folks come to hike the Lava Flow Trail as it meanders across one of the largest single lava flows in southern Arizona. It looks barren but there are coyote, desert bighorn sheep, javelina, quail, giant spotted whiptail lizard and numerous other birds, reptiles, insects and arachnids living on the property. There's enough small game to support a good population of raptors. To get there: see the map below. 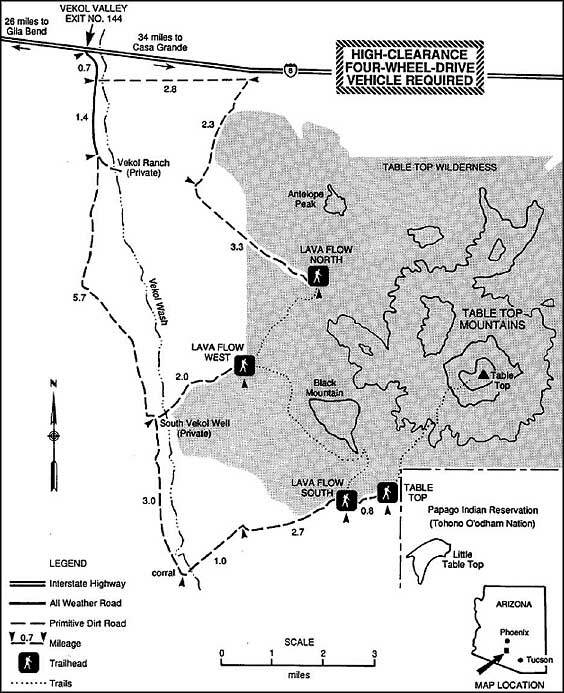 The primary access roads come from the Vekol Road exit (#144) on Interstate 8 as most of the eastern and part of the southern boundary of Table Top Wilderness is against the Tohono O'odham Nation. Vekol Road is maintained, somewhat, but can be washed out at times.